Vermont Castings have a very well established reputation for making reliable, high quality, efficient stoves that are really built to last. Testament to this is the people who come to us for a couple of spares for their 20 year old Vermont stoves. Vermont stoves do everything in-house, even down to the cast iron which they make from 100% recycled iron. This means that Vermont can manage quality and consistency of their stoves throughout the process. If you meet someone who owns a Vermont stove then you may well find them to be positively evangelical. 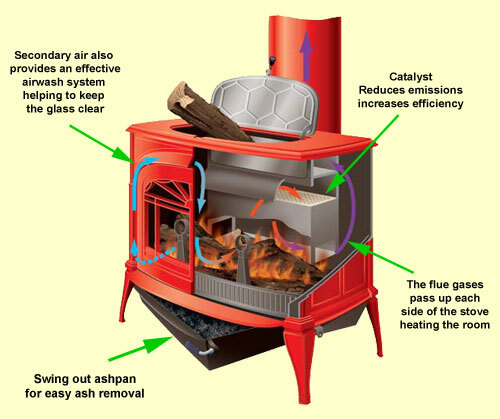 Vermont Stoves are a progressive company and started to incorporate catalysts (which reduce emissions and increasing efficiency) back in 1982. The flow of the hot gases inside the fire chamber is also very well thought out; in the catalyst models the gases are brought through the catalyst matrix at the back of the stove, down and then pass through chambers at the sides of the stove being allowed to flow across the top of the stove and out. This strips even more heat from the gases and at the same time helps to keep the fire chamber hot, all increasing efficiency. Vermont stoves have the facility to load fuel from the top which makes them different from many other stoves.er stove manufacturers. The top plate of a Vermont stove also acts as a cooking surface where a kettle or casserole dish can be heated. The quality of the enamelling for the coloured stoves is very good and you have accessories like spark guards, warming shelves and matching steamers that really complete the picture. Another plus point for Vermont stoves is that they have a clever swing out ashpan with attachable cover which makes for emptying out the ash a very simple, clean operation. All models have an efficient airwash system but more than that; some of the multifuel versions have glass with a special metal coating which reflects around 30% of the heat back into the firechamber making it inherently less prone to sooting up. Vermont led the field in using this special type of glass for stoes, and first did so way back in 1983. One of the classic Vermont stoves, the Intrepid is popular with existing and new owners alike and the woodburner is now Defra Exempt. The Vermont Intrepid has the trademark window tracery, firechamber catalyst, optional warming shelves and is available in a range of fine enamelled colours. Vermont stoves are well known for their quality, effectiveness, durability and classic style. The flue pathways inside a Vermont are ingenious and they were one of the first to start using catalysts to reduce emissions and increase efficiency. As well as the more traditional models Vermont now also make some more modern looking stoves, to the same standards of course. The Vermont Encore woodburning stove gives you the choice of using the integrated catalyst for higher efficiency and lower emissions, or to bypass it for a more relaxed flame pattern. An 8kW woodburner, the Encore is suited to the medium sized room.